A couple months ago, my husband's best friend and college roommate, Reece, moved to Germany on a contract with his company. When we heard about the big move, Chris and I were ecstatic to have a familiar face so close by. "Close" is relative. Google Maps claims Regensburg and Subotica are an eight hour drive from each other, but it still seems close when the rest of "familiar" is an ocean (and then some) away. Chris and I started planning trips for three people rather than two and trying to coordinate work schedules, because after all, experiences are better when shared with friends. 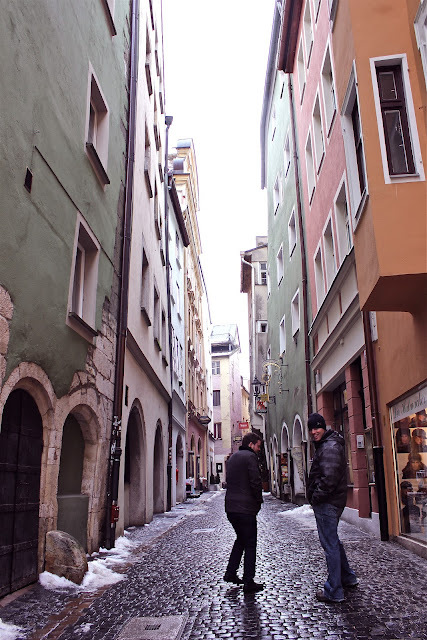 In December, we met Reece half way in Vienna, Austria for a fabulous trip through the main stomping grounds of the Hapsburg family. Here is the blog I wrote about that trip just in case you're interested. We had to visit both new "homes" next! Both Chris and Reece have been extremely busy with their prospective companies, so a long weekend seemed out of the question. Or so we thought! Chris and I were pleasantly surprised last week when we realized that Serbia had a two day "bank holiday" and then the government granted everyone a third day off of work (which just happened to be Friday) due to the snow and power rationing. Chris had to work from home for two of the days, but spur of the moment, on Thursday afternoon, we jumped in the car Germany-bound. Of course there was a delay at the border, but, "this is Serbia after all!" We have come to expect such delays. Exactly eight hours after leaving Subotica, we rolled into Regensburg, Germany. Wine = the most perfect welcome to Regensburg, Germany! Reece met us with a bottle of wine, but since all of his possessions had just arrived from the States, he couldn't find a bottle opener. Leave it to two engineers to know how to quickly open a bottle by pushing the cork INTO the bottle. Clever little trick I'll keep in my back pocket for later! An old city model overlooking the Danube River. On Friday, we walked all around the city of Regensburg: checking out ice cream cafes, enjoying the architecture, peeking into old buildings and ducking into hole-in-the-wall bars every so often to avoid the rain. I also annoyed the boys by making them pose every other minute for a picture. From the moment we started exploring Regensburg, I was struck by how quaint, clean, organized and ancient the city appeared. This brick tower dates back ancient Roman times. Well - to be fair, it is an ancient city! I found myself fascinated with this particular brick tower in the middle of Regensburg. Seen here are the remains of the East Tower of Porta Praetoria from Ancient Roman times. It seems that this tower could date back as far as 179 A.D.! I was just overwhelmed as I tried to capture this piece of history in the small lens of my Canon Camera. Chris and I learned that Regensburg was a unique Germany city as it evaded the Allied bombings at the end of World War II. The bombings were avoided simply because the bombers ran out of fuel.Lucky for Regensburg. The history of the city is incredibly rich, and since Regensburg was preserved while many other German cities were destroyed, the nearly intact medieval city is now listed as a UNESCO world heritage site. 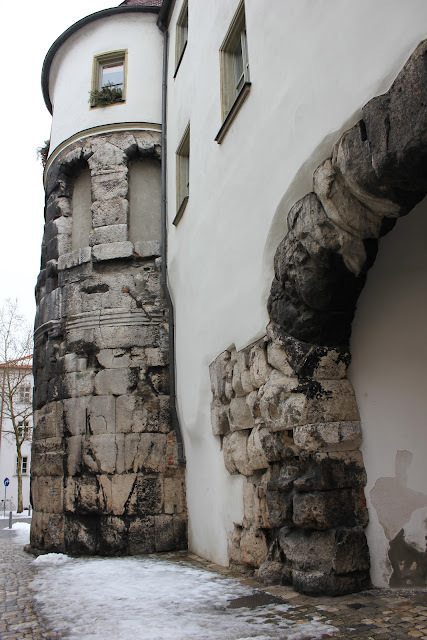 Enjoy a few pictures of the stunning city of Regensburg, Germany. The Regensburg Cathedral or "The Dom." Quaint and brightly painted streets. The kicking pose on the Stone Bridge. The family that owns the Furstliches Brauhaus lives here. No big deal! Awesome hole-in-the-wall bar with ceramic mugs for beer and wine! Germany is full of well designed pubs! I cannot wait to get back to Regensburg! Chris and I are already planning a trip back in May when they have their own little beer-fest! October Fest what??!?! Not sure if you noticed, but if you are heading to Hungary from Serbia, chances are if there's no one on the Serbian side at the border ,there will be at least 30 cars on the Hungarian side. If there are 30 cars in line on the Serbian side that means there will be 150 cars in line at the Hungarian side. Ohhhh we have absolutely picked up on that pattern. I have no idea why there always seems to be an extra hold up at the Hungarian side. The border is so miserable! I hear it is WAY worse in the middle of summer. Boo! In the middle of the summer is when the "guest workers" (people who work in Germany/Austria, etc go home for 2-3 weeks. Then the border crossing is unbearable. In plain words, the line is SO LONG it stretches for miles and it takes about 15-24 hours to get through it. If you are travelling during the summer guest worker months, its best to use the Kelebija border crossing, that is; until the authorities start redirecting highway traffic there, then both border crossings are complete CHAOS! If you have a Serbian or Hungarian citizenship, you can use special crossings which are just for the citizens of either/or country. That is the alternative in the summer months as on these crossings there's not much wait.